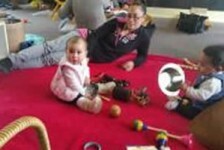 Nāku Ēnei Tamariki Inc. is a pro active intensive early intervention home visiting support service for young parents and their pepe. Established in 1993, NET operates three cultural units – Māori, Pacific Island and Pākehā. All services are confidential and free for whānau. NET Māori section believes all pēpi and tamariki in Te Awakairangi are nurtured in all aspects of their wellbeing and development to realise their unique potential within their whānau, hapū and iwi. 6 x Home Visiting programmes, that utilise a variety of different mediums to encourage and support whānau to understand the role of parenting. In order to provide a nurturing and safe environment for tamariki Māori. 4 x Group programmes, that assist whānau to get the best and most suitable early learning opportunities available within their communities. To create a greater understanding of and support network for learning in effective parenting skills. The Māori Section of NET has been based at Kōkiri Marae in Seaview since its inception in 1993.